Why GIS on the Web ? EITNL creates custom GIS applications that provide efficient and secure access to our clients’ valuable GIS, CAD and database information resources. Our internet-based systems run on standard web-browsers (including mobile devices), are simple yet powerful, and can be used by non-expert users ... even the public. Our innovative solutions allow our customers to un-lock valuable data resources and make better, more timely decisions. 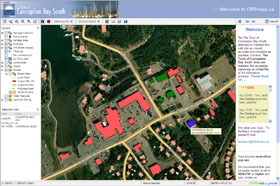 EITNL fully supports and integrates major GIS, CAD and database environments including ESRI ArcGIS, Autodesk AutoCAD and all standard geo-referenced image formats including compressed Mr Sid and ECW. We view each client’s needs as a unique challenge and we strive to implement custom GIS applications that integrate seamlessly with our clients' existing data management systems and complement client business practices.